A few days ago, I vented on Twitter about my frustration with the situation of motorcycle (motos) taxis in this country. As with my previous threads about motos – I said phase out. 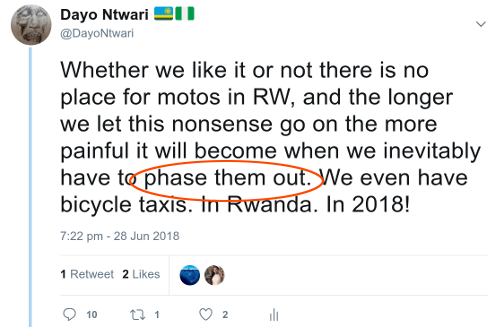 Unfortunately, this was Twitter and with reading comprehension levels being what they are on that platform, Rwandans on Twitter (#RwOT) read “phase out” to somehow mean “ban“. One of my favourite sayings is “The truth is irrelevant. People believe what they want to believe.” Rwandans like these believe I would like motos banned. A number among them believe I hate the poor, and therefore want motos banned. One of my favourite sayings is “The truth is irrelevant. People believe what they want to believe.” Rwandans like these believe I would like motos banned. A number among them believe I hate the poor, and therefore want motos banned. When I say there are too many motos and the problem is getting out of hand, these Rwandans believe this is not the case. 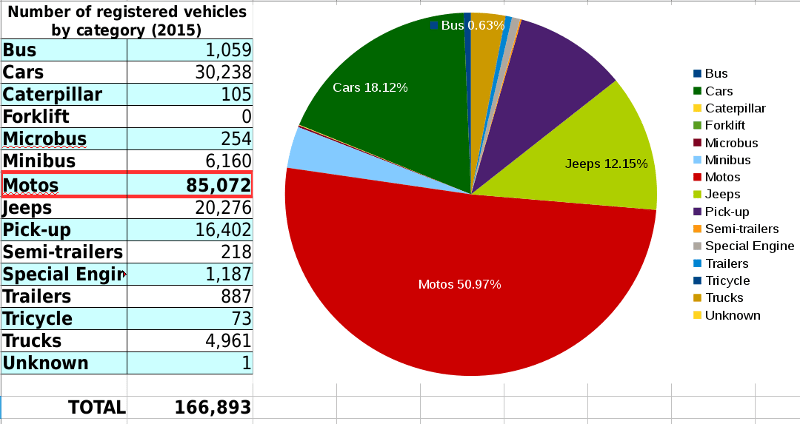 But regardless of what anybody believes, whether it’s “motos are better than buses”, “motos don’t cause more accidents than other vehicles”, “motos solve unemployment”, “motos are not dangerous”, “Dayo is privileged and hates the poor”, let’s just have a look at the facts, shall we? The above newspaper quotes from our nation’s police, medical personnel, as well as the moto accident victims themselves, tell a grim story. Police are doing everything in their power. The sensitizations which #RwOTs regularly tout as a cure-all, are quite obviously not yielding results. The moto menace is not a problem solvable by sensitization campaigns. It is a waste of police resources to continue to pretend like the taxi-moto scourge is a police problem. It is not. Taxi-motos have been able to spread like a virus across the country, because of the stagnation in our embryonic public bus system. I am immensely proud of how RwandAir is expanding its international routes, but here at home in Rwanda we are still stuck with a public transport system that is majority taxi-moto. Taxi-motos are not only maiming and killing our fellow Rwandans, taxi-moto are also a cancer which firmly holds in its grip Rwanda’s fledgling public transport sector. Motos are a deadly quick-fix stifling the sustainable implementation of a professionalized, safe, world-class mass transit system. Here are some statistics available from the National Institute of Statistics Rwanda (NISR). 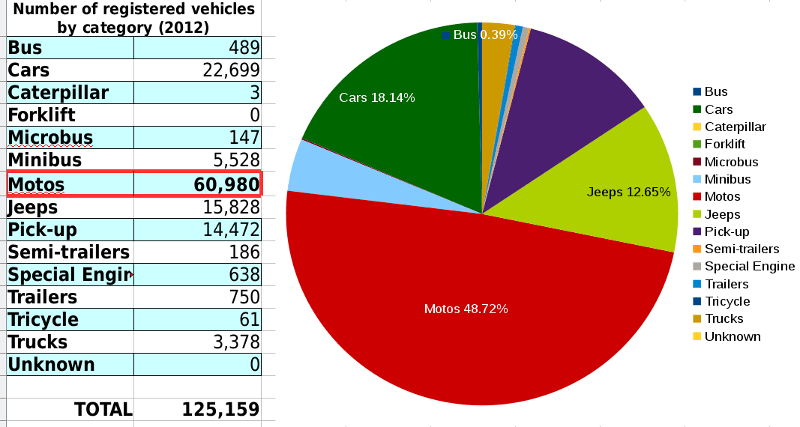 As you can see from the government data above, four years ago (2014) motos became the majority of registered vehicles in Rwanda. This is not opinion. This is fact. When I say our traffic has become unmanageable in Kigali because of motos, the facts support this perspective. Even without these government-provided statistics, simple observation of Kigali’s roads show the truth: we are flooded with taxi-motos. Everywhere you turn, in your immediate field of vision you are highly likely to find many more motos than all other vehicles combined! In such an environment as Rwanda today, can you invest in public bus transport, when you know motos are the overwhelming majority? According to the RURA Transport_Statistics_Report_as_of_March_2018, we have 48 licensed public bus and minibus companies and cooperatives, with a combined fleet of a paltry 3,648 buses between them. Of those 48 licensed bus companies only 3 serve Kigali, with a combined fleet of not more than 150 buses. 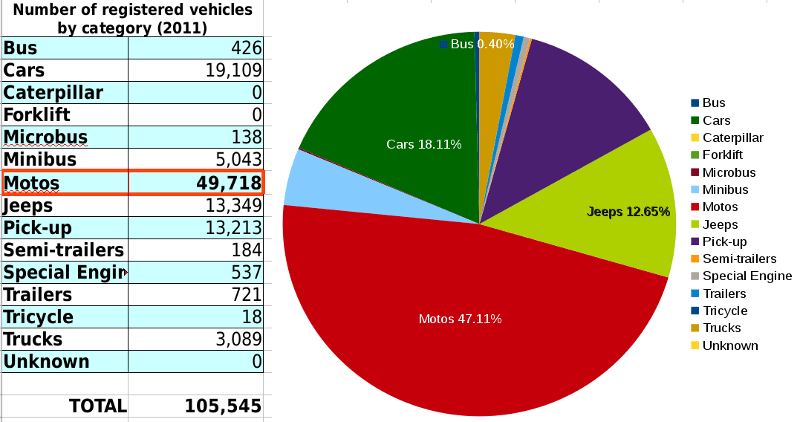 In contrast, RURA lists 147 licensed moto-taxi companies and cooperatives, with a whopping total of 32,230 motorcycles between them. How are the bus companies in this city supposed to compete against that? Mind you, the 32,230 motos RURA is talking about are licensed. As the cooperatives have been quoted in TNT above, many of these motos you see on these streets are unlicensed. So, the real number of taxi-motos is higher than 32,230. Do you know of any unlicensed public buses in Rwanda? Can you realistically expect existing and prospective bus companies to invest in a business sector that is in effect rigged against them? A favourite excuse for why the taxi-moto disaster should be allowed to continue to gravely injure or end lives of taxi-moto drivers and passengers is “Motos solve unemployment and contribute more to the economy than Bralirwa.” The economy is more than alleged profits from the most dangerous public transport mode in the world. Those among you who use this excuse, are ignoring the medical costs suffered by taxi-moto accident victims. You are ignoring the cost to the economy of families losing bread-winners due to disability or even death! 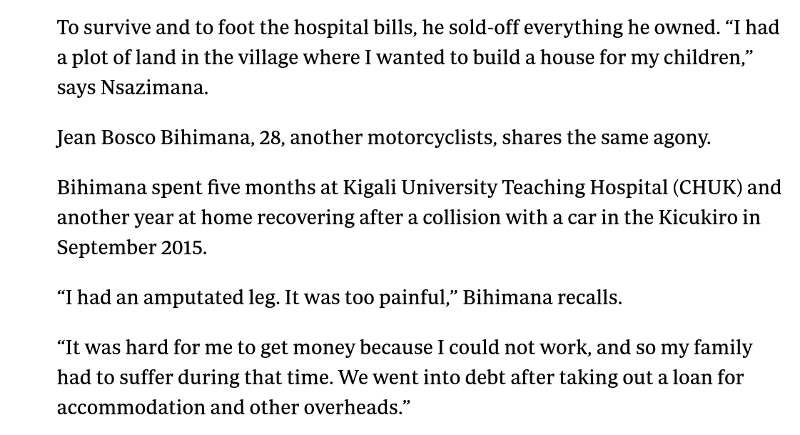 For low-resource countries […], high economic costs of motorbike accidents can pose additional burden to the fragile health system. These accidents can be prevented, and their consequences can be alleviated. There is an urgent need for reinforcement of appropriate interventions and legislation to decrease its magnitude and its associated grave economic consequences so as to nib this emerging epidemic in the bud. Emerging epidemic. In the Philippines the government has already begun the process of phasing out taxi-motos, with a target deadline of 2020. In 2017, Kuala Lumpur banned all taxi-motos due to safety concerns. Hanoi has set 2030 as the target to ban taxi-motos, to unclog the streets and reduce air pollution. Meanwhile, in “green” Rwanda, taxi-motos have taken over and will continue their unchecked deluge? As the data presented above has proven, this is not a police problem. The Traffic Police are doing their very best. This problem goes beyond the police. The police is not responsible for developing a mass transit network. Every red light in the country, watch the hive of motos. See how they behave. Every single time they violate the red light, when there are still 3-4 seconds of red left on the traffic light. Keep in mind, there are generally no less than 50 motos at a given main road traffic-lit junction. How do you expect the 2-3 Traffic Police officers to deal with that? Especially, when you and I know these motos are enjoying the benefit of influential voices having spoken for them in the past. A large number of these motos are owned by members of Rwandan society, who are senior to the boss of the Traffic Police you see standing at the junction. So, what exactly is he supposed to do? We have tied the hands of our police and then we throw tens of thousands of hooliganistic taxi-motos at them and say “Here, fix it!” How? Did you add magic to the police resources, perhaps? Because that is the only way Traffic Police can fix this mess that we created. So, how do we phase out taxi-motos? How do we build a mass transit network comparable to the best in the world? A set of immediate measures, followed by mid-to-long-term steps. First of all, an immediate cessation of any further taxi-moto registrations in Rwanda. The radical growth of the taxi-moto population must be halted, otherwise no measure any of us can come up with will be of any use. In Kigali, restrict all taxi-moto to residential roads only. That is, no taxi-moto allowed on main roads anymore. And prohibit motos from operating in the Central Business District. This immediate measure will relieve the pressure on our city’s traffic, by reducing the unsustainably high traffic density in a city with mostly just 2-lane roads. Allow more bus companies who are smaller players, into the business. By “smaller players” I mean, if you and I can put our spare amafaranga together and form “Dayo & Ngabo Bus Co.“, and we buy maybe one or two minibuses or even a Coaster, the City or RURA should allow us to operate. That is, the licensing should be per route, not per company. So for example, if the routes in Remera are saturated by buses, then the City/RURA should only offer bus service licenses for routes in under-served areas. These licenses should be renewable every 6 months, to begin with. If in that period “Dayo & Ngabo Bus Co.“, fail to adequately serve the route according to a set of predetermined parameters, then our service license will not be renewed. Maybe we might be encouraged to try a different bus route, more suitable to our company’s capacities. I prefer the second option, because it allows people who have been investing in these 2-wheeled coffins called taxi-motos, to come together, buy a minibus and make more money, while giving the driver a safer job, which makes the driver more money, too. And yes, minibuses should be brought back. And when bringing back minibuses, restrict them to short bus-circuits. For example, routes involving trips from Kimironko bus terminal to the bus terminal in town or in Nyabugogo should only be licensed to companies with Coaster-sized (and above) buses. Minibuses, in this scenario, would ply the Zindiro to Kimironko bus terminal or Zindiro to Kisimenti routes. Whichever options we go with, there needs to be a fixed bus schedule for every single route in the country. This schedule must be displayed in every bus stop. Every bus stop should have someone employed by the City/RURA (not affiliated to any bus company) who makes sure buses drive on to the next bus stop without exceeding their wait-time. Companies who overstay at bus stops will receive points, and during the license-review period, if a bus company has incurred a certain amount of points, it will be fined. If the bus company has exceeded a points range above that, it will have its license revoked and needs to re-apply for a new route license. Bus companies whose buses are involved in accidents will also receive points towards this review. Where do the taxi-moto drivers we are trying to phase out fit into all this? Well, the most obvious slot is bus driver. But bus-driver is not the only job. For one thing, the bus stop monitors which the City/RURA will employ for every single bus stop in this scenario, should exclusively be ex-taxi-moto drivers only. Bigger bus companies in this system will also require more non-driving personnel. Again, priority should be given to ex-taxi-moto drivers. Fix a minimum ex-taxi-moto staff quota which big bus companies have to fulfill, in order to keep their service license. Whether it be fleet mechanics or book-keepers, together with government (by subvention) the big bus companies must agree to train ex-taxi-moto drivers to become fleet mechanics, book keepers, customer support reps, route managers, etc. The prime avenue for such training should be the TVET system. Further, all other ex-taxi-moto drivers who find no employment in the new mass transit system, should be given government scholarships for re-training in the TVET system, where they can learn a vocation or trade. Again, quotas will need to be set, be they in the construction industry, agric industry and so on, to give preference to ex-taxi-moto drivers who are TVET-graduates. These government TVET-scholarships should be set up as an interest-free loan, which the ex-taxi-moto drivers can then repay over a 10-year period, for example. These are just a set of basic ideas, which refute the notion that we cannot find safer work for taxi-moto drivers. People who argue for taxi-moto do not really care about the poor, themselves. They do not care about the health and well-being of taxi-moto drivers and their passengers. They do not even care about their own health and well-being. You see some of these ladies on motos not even wearing helmets. They hold the helmet above their heads so as not to mess up their hairdo. As if their coif can protect their heads in an accident. It’s baffling, isn’t it? Taxi-motos are already affecting each other in their crazy numbers. Just two years ago, when you tried to flag down a moto, if the driver didn’t see you in time, he’d just give you a lazy glance and keep driving. Today, there is an overpopulation of taxi-motos. So much so, that whenever you approach a moto cluster, like 4 or 5 of them will rev their engines and come racing towards you. Almost half a dozen motos struggling for a single passenger. 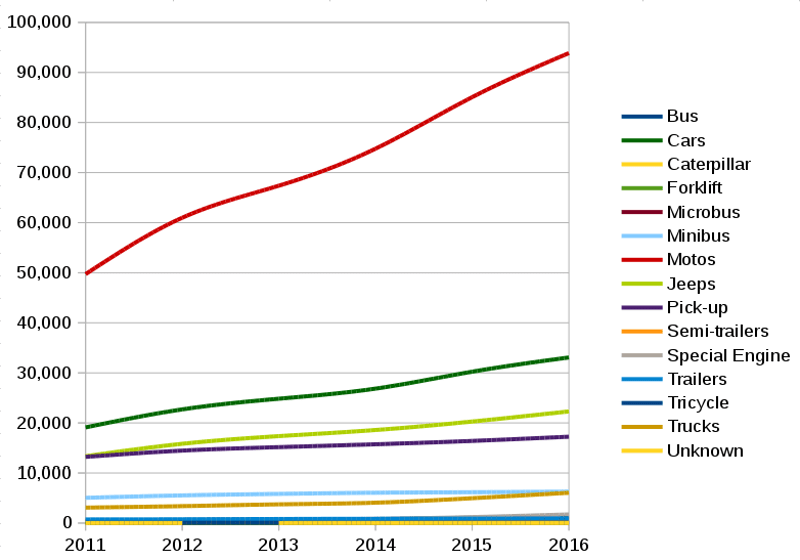 This is a terrible sign that the “moto-market” is collapsing. If something is not done immediately, this country will deeply regret the consequences. The “moto-bubble” is about to burst and we will all be caught with our pants down, I tell you. “Sensitization” is not the answer. Safe-Motos is not the answer either. Safe buses is what is needed in this country. And years after that, “Dayo & Ngabo Bus Co.” and the other bus companies will become joint-investors and subsequently joint-shareholders in Rwanda’s elevated rail or aerial tram system. Why not? Remember, when the City intervened on behalf of commercial real estate developers and forced businesses to move out of residential houses and into commercial buildings? This is regulation. The same must be done for the public transport sector. Reform it, phase out motos, by capping their numbers and restricting them to residential areas, while moving them into the revamping mass transit system.